Guess the 80's are gone, so here comes Iron John in the guise of a reformed yuppie who cares. Jerry Maguire (Tom Cruise) is a high-flying, high-earning sports agent on a non-stop roll toward the top until he suffers pangs of humanity and spontaneously decides to write a visionary memo (in the form of a Mission Statement) titled "The Things We Think And Do Not Say: The Future of Our Business." Jerry has amazingly discovered the concept that people might be more important than money and decided to share this novel thought with his colleagues. In the world of high finance, however, casting such an observation is, of course, a grand mistake with suicidal overtones. Jerry gets fired (after all, who wants radicals running the show and ruining the action?) and manages to lose the fast-paced ambitious girlfriend who dearly loved him for his looks, his money, and his position (after all, what's a gal like that gonna do with a loser?) Before he knows it, everyone's running in the opposite direction with the exception of his one remaining client, a second-tier wide receiver for the Arizona Cardinals (Cuba Gooding Jr.) and an accountant (Renee Zellweger) who supports him in his actions, beliefs and humanitarian(?) insights. 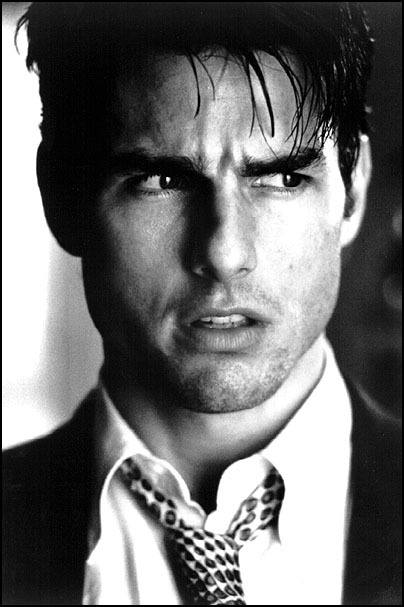 Tom Cruise stars as Jerry Maguire. © 1996 TriStar Pictures Inc.
Cruise delivers a fine performance in a less than involving script. On the other hand, there is probably a large group of yuppies who will eat this film up and find reassertive support for the argument that even though they're out to cut the opposition's throat, they're really sensitive new- age guys at heart. Cameron Crowe has already established himself as a talented director, but the shallow content of Jerry Maguire makes one wonder what the future holds in store. The Mission Statement upon which the events of Jerry's life take a turn was actually written by Crow during the creative process to prepare the film. Considering that the content of this document will probably never reach most viewer's eyes and that it not discussed to any serious extent within the framework of the film, I shall offer a short, intelligent and concise critique by simply stating that it contains thoughts and self-reflections that not only would have occurred to any intelligent being during formative years, but that it deceptively pretends to be what it is not. Confused? This so-called masterful revelation referred to as the Mission Statement pretends to be out for the well- being of all involved ("The result will be more honesty, more focus, fewer clients, but eventually the revenues will be the same. Because the new day of honesty will create a machine more personalized, more truthful, and the client that wasn't bullshitted this year, has a greater chance of greatness next year. "), but is, in truth, a method to put vast numbers of clients on the unemployment line while still achieving the same lucrative benefits for the agent. Instead of being titled "The Things We Think and Do Not Say", it might have been given the title "The Things We Should Say and Not Really Mean." Not to worry, that's how things will work out in the end, anyway. Let's take another example from Jerry's revelations: "How many people have said this in our presence: 'I thought I would feel better when I was rich, but I don't.' That happens when we don't listen to the loud sound of the quiet voice inside. Life, I believe, is not a country club where we forget the difficulties and anxieties. Life is the duty of confronting all of that within ourselves. I am the most successful male in my family, but I am hardly the happiest. My brother works for NASA, helping grow blue-green algae that will one day feed the world. He was originally targeted as the 'successful' one in my family. But he gave up early, for a quieter kind of success. He was once tortured, now he is quietly making the world a better place. He learned earlier what I am just now starting to wake up to. He sleeps well at night. And he doesn't worry about being too preoccupied or too busy to get the dance right. He dances for something greater." I wish enjoyment to those of you who are into the earth-shattering expressions of the Jerry Maguire school of thought. As far as I'm concerned, I think I'll stick to Thoreau. When all is finally said and done, the film appears to attempt to spread the message that all bright young yuppies seeking fortune and power are missing the boat as well as missing the point that they need to get in touch with their inner selves if they want to realize their full potential, which ultimately means (according to the ethics of this film) making even more money. Who said you can't have it both ways? In any case, it certainly wasn't Jerry Macguire. On the other hand, let us not eschew the mixture of a talented cast and crew (including DP Janusz Kaminski) in the capable hands of a knowledgeable director and a super- producer (James L. Brooks) and who is going to even ask questions about nominations for Oscars®? At least you know what you're in for before the lady selling tickets at the cinema says "Show me the money".